I like to think of Southern Comfort as a gateway liquor. Everyone tries it at some point in their drinking journey, and many have that one shameful night in college where it all started with a bottle of SoCo. No I’m not knocking Soco, just the fact that it gets tossed around at college parties like its Coca Cola. But we’ve had good and bad experiences with it. I don’t personally keep a bottle in my liquor collection anymore but I have been a fan of some of their flavored releases over the past few years. Soco lime was ok, and we really loved Soco Cherry that launched a couple of years back. 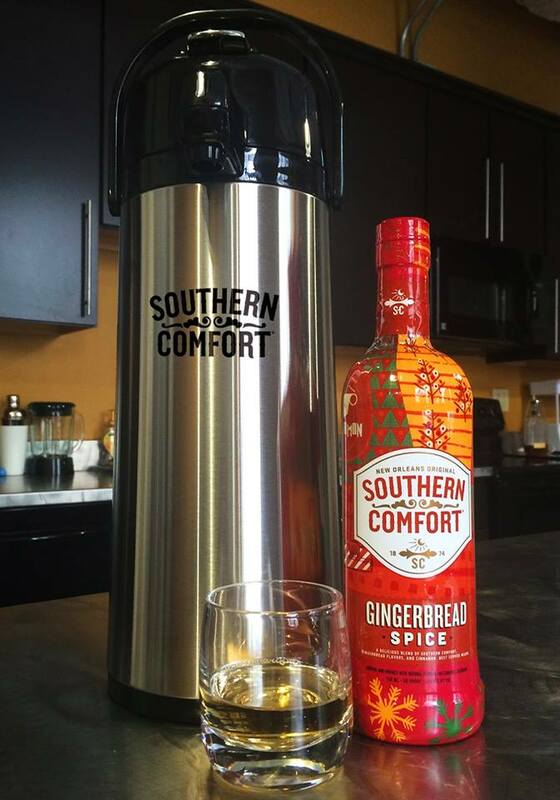 Now just in time for the Holidays we got our hands on a bottle of Southern Comfort Gingerbread Spice. First Impression: If you’re into collecting bottles SoCO Gingerbread comes festively in a christmas plastic wrapping that covers the traditional bottle. When your pour it you see it’s not as dark as traditional soco, it’s a bit lighter but the aroma is amazing. It’s like smelling a fresh batch of gingerbread cookies on Christmas eve. And the aroma completely masks the smell of the alcohol. This one’s only 30 proof so it makes sense. Tasting Notes: Southern Comfort wasn’t playing when they made Gingerbread the featured flavor, it’s got a lot of sweet gingerbread spice flavor and almost no alcohol taste or burn. The combination of Soco and the gingerbread give it a sweet taste that I can only describe as a can of coke that’s lost its fizz. If you pour this one over ice and tasted it blind I don’t think anyone would guess soco. Even though many people confused Soco with whiskey, it’s actually a liqueur, so when they release limited flavors like this it drinks more like a cocktail straight out of the bottle. If you like the sweet stuff pour this one over ice and its good to go OR you can do what I did and add this to pitcher of egg nog and see what happens. It mixed great. Final Word: Like I mentioned earlier, I’m not a big fan of SoCo original these days but I like the flavor editions they’ve been launching and although I don’t think I would buy this any other time of the year, it works great during the holidays. You can sip on this, add coke, or put it in the holiday punch and you’ll be good to go. It’s pretty cheap and it’s not rough on the alcohol content so it’s not a bad pick up if you’re looking for something new to try this Christmas. Photo courtesy of Southern Comfort.